House MD Episode Guide: Season Two #215 "Clueless"
Second Season Episodes :: #215 "Clueless"
so after reading the ones below, click on the "Search" button above to search for "215". House (Hugh Laurie) fights to find proof of how a woman is trying to kill her husband in the HOUSE episode "Clueless" airing Tuesday, March 28 (9:00-10:00 PM ET/PT) on FOX. A doctor, who can't figure out what the problem is refers Bob to House. House says pretty consistently that it is heavy metal poisoning but they test for all the usual suspects and all are negative. So, Foreman keeps insisting it must be a typical lupus. None. Foreman investigates the patient's house with the wife's help. Bob's wife Maria has been poisoning him with gold. Married man with Herpes. House suggests that his wife is having an affair and gave it to him. When the couple comes in to complain to Cuddy, House demonstrates that it is really the husband who has been unfaithful. Wilson is staying with House: sleeping on his lumpy couch. House's TiVo has the following recorded or scheduled shows: "The O.C. ", "Spongebob", "Monster Truck Jam", "New Yankee Workshop", and "Blackadder". House gets a message for Wilson about an apartment that Wilson has made arrangements to rent, but House erases the message and doesn't tell Wilson about it as if he finds Wilson to be useful around the house. in the HOUSE episode "Clueless"
Tues. March 28 (9-10 PM ET/PT) on FOX. Guest Cast: Samantha Mathis as Maria; Eddie Mills as Bob; Peter Birkenhead as Vincent; Stephanie Erb as Charlotte; Yareli Arizmendi as Lady. The song at the end was "Love and Happiness" by Al Green available on his Greatest Hits album. Amazon's main page on the album allows you to listen to a piece of it. House returning home to find that Wilson has cooked dinner: "Good Lord, what is that smell?" House: "Stuffed with what? Vomit? I thought you were going to a hotel." Wilson: "I found an apartment. I can move in on Monday. Is that fast enough for you?" House: "What's today? Where'd you get all that stuff?" Wilson: "Well, not from your kitchen. Don't you ever eat anything besides canned soup and peanut butter?" House: "Don't you ever eat anything that doesn't look like it's been rolled onto your plate by a dung beetle?" Wilson: "Try it." And the after House takes a tentative taste, "It's good, isn't it?" House, refusing to admit to how good it is: "No. Just better than it looks." Cameron to House who claims that their patient is being poisoned by his wife: "She's not poisoning him!" House: "It's the only explanation!" Cameron: "No, it's the only explanation your twisted mind can come up with because you're angry that you can't find the answer and you're taking it out on her!" House: "And you are protecting a complete stranger based on some childishly romantic notion that people are all so happily married they don't want to kill each other!" Cameron: "Are you calling me childish?" Cuddy, interrupting the fight: "Shut up. Both of you." Chase, while House is confronting the patient's wife: "Heavy metal tox screen for gold was off the chart." House: "If you were trying to kill him, I'd love to know the why behind that why. But you're not going to tell me, are you?" Maria: "You're wrong. I love Bob." House: "I never said you didn't love him." Cameron later to the others:: "Why would somebody do that? Sit by somebody's beside day and night, helping them, comforting them, and at the same time killing them?" Foreman: "Maybe he was having an affair?" Chase: "Maybe she was having an affair." House: "Or maybe she just gets her kicks slowly sucking the life out of a guy and watching him suffer." Foreman: "He must have done something to her." House: "Yeah, he had it coming." Foreman: "I didn't say he deserved it." Chase: "The only thing he did wrong was marry a sociopath." House: "Or maybe she just got tired of being married. Didn't want to admit to family and friends that the marriage that everyone thought was perfect wasn't." Cameron to House when she comes to pay off the bet they had that the patient and his wife had a good marriage: "You're pleased. You think you've proved every marriage is a mistake." 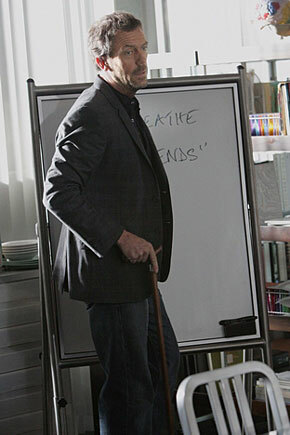 House: "Do I look pleased?"